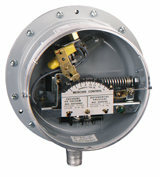 Large diaphragm sensitivity and time proven dependable design are combined in model PG differential pressure switches. Visible dial reduces "start up" time and helps prevent calibration errors. External adjustment allows set point change without removal of cover. Unit is listed by UL, FM and CSA. ¹ SPST switches shown in chart closes on increase of pressure. For opens on increase of pressure, replace "3" with "2". Example: PG-2-P1. Models are stock and the same price. Wetted Materials: Fairprene, brass, steel, and aluminum. Sustained Pressure: 15 psig (1.0 bar). Surge Limit: 20 psig (1.4 bar). Sustained Pressure, Range P1: 2 psig (.14 bar). Sustained Pressure, Range P2: 10 psig (0.7 bar). Enclosure Rating: General purpose. Weatherproof and explosion-proof optional. Repeatability: ±1% of full range. Switch Type: SPST mercury switch, SPDT mercury switch, or SPDT hermetically sealed snap switch. Electrical Rating: SPDT Mercury: 4A @ 120 VAC/VDC, 2A @ 240 VAC/VDC. SPST Mercury: 6A @ 120 VAC/VDC, 3A @ 240 VAC/VDC. SPDT Snap: 15A @ 120 VAC, 8A @ 240 VAC, 0.5A @ 120 VDC, 0.25A @ 240 VDC. SPDT H.S. Silver Snap: 5A @ 125/250 VAC, 30 VDC resistive. SPDT H.S. Gold Snap: 1A @ 125 VAC, 30 VDC resistive. Conduit Connection: 7/8" (22.23 mm) hole for 1/2" (12.7 mm) conduit hub. Process Connection: 1/2" male NPT and 1/8" female NPT used for single positive pressure or high differential pressure, 1/8" female NPT used for single vacuum or low differential pressure. Set Point Adjustment: External screw. Weight: 4.5 lb (2 kg). Agency Approvals: UL, CSA, FM for mercury switch models. UL only on snap switch models.